Hi ladies! So as I mentioned on my Sunday Post last weekend, it was my birthday on Monday! It was such a lovely day and even the sun came out! 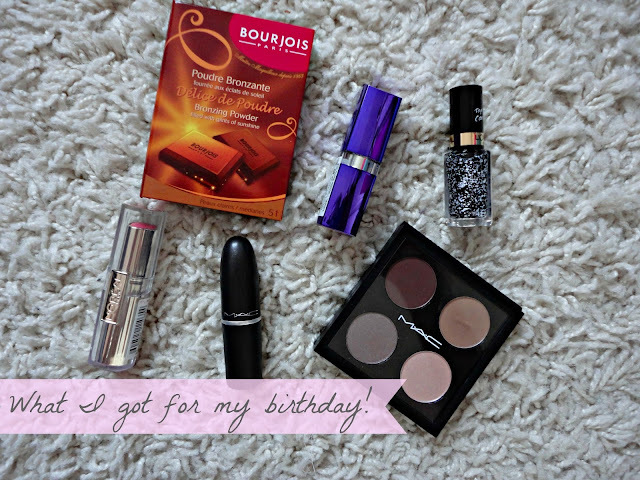 I promised a post on what makeup bits and bobs I got so here it is. I'm only going to do a couple of sentences on each product because I do want to do full reviews of all these products in the near future! Enjoy. 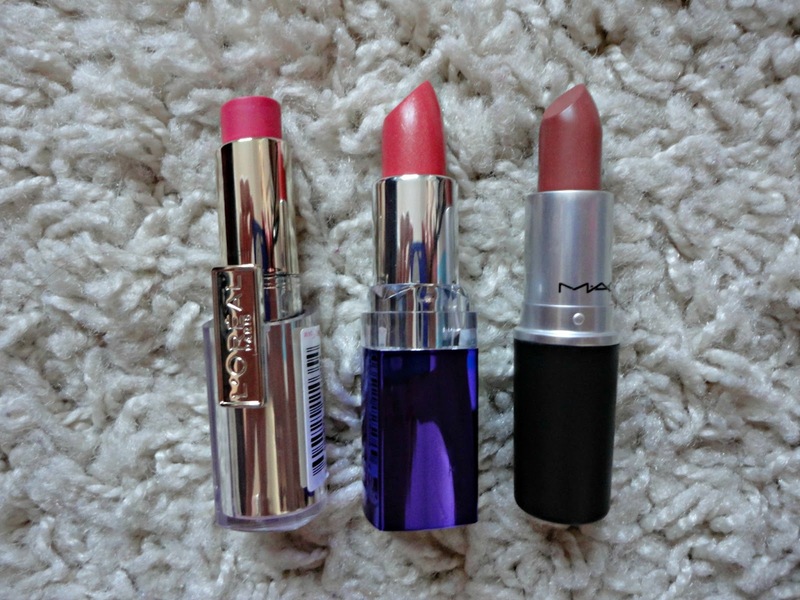 I went a bit lipstick crazy and got 3 new lipsticks, which I can't wait to try out! Firstly, I got 'Rose Mademoiselle' from the L'Oreal Rouge Caresse range. I swatched it on my hand and fell in love - it's the perfect rose pink! Then I got 'Soft Coral' from Rimmel. I was looking for 'Coral Queen' as Tanya Burr recommended it on her April favourites but when I saw it, it looked a bit too bright for me! I went for this softer colour because I think coral lips will be so lovely for summer and I don't have a colour like it. Finally, I got MAC's 'Velvet Teddy'. I think I saw a blog post on this lipstick and from then on had my sights set on it. It's from the matte range, so I'm not sure how creamy it will be, but it's a lovely colour nevertheless and I can't wait to use it! Next, I got the 'chocolate' bronzer from Bourjois. 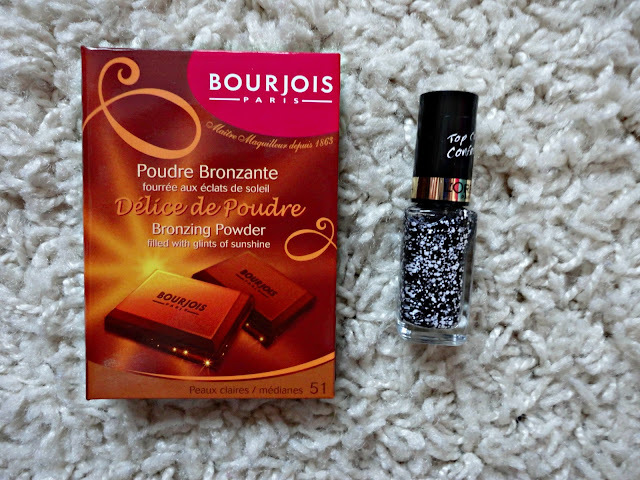 I'm on a mission to find the perfect bronzer/contour colour for pale skin because literally everything I've tried has been too dark or too orange! After seeing this featured in some YouTube tutorials, I went for this because the effect looked really nice. I got it in 'light' (of course) and on first impressions, it seems like I've found the perfect colour for me! Also, I got the L'Oreal confetti top coat. I just can't justify spending £14.50 on the Illamasqua version (as gorgeous as they are!) when I can paint this on top of any of my colours to get the same effect. And finally, my new baby. After pining after a MAC palette for months, I finally got it! I was going to get the 15 x palette to start to fill up, but there were none in stock so I got a 4x one instead. I knew exactly what colours I wanted from hours of blog/YouTube research! 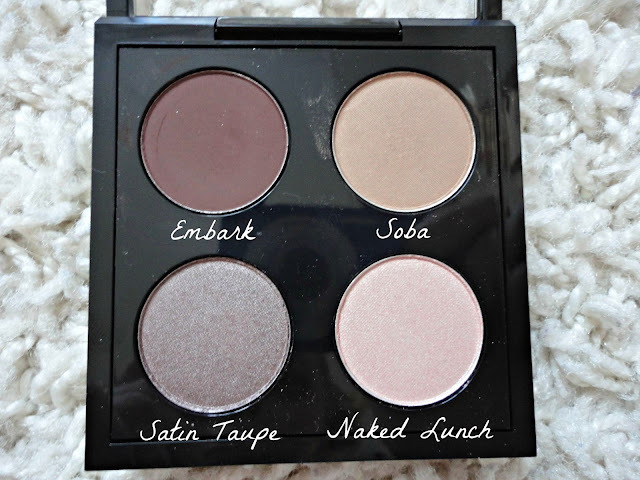 I got Soba & Embark which together create a gorgeous brown smokey eye. And then I got Naked Lunch & Satin Taupe because they're lovely everyday colours and are Tanya Burr's favourites (anything she likes, I like!). I've already worn all 4 colours, so look out for a more indepth post/review on CTHNSYR soon! I think that L'Oreal top coat is amazing, I hope you post some pictures of what kind of nail art you come up with when you use it. Also loving your MAC quad, you picked some beautiful colours - Looking forward to reviews on everything.